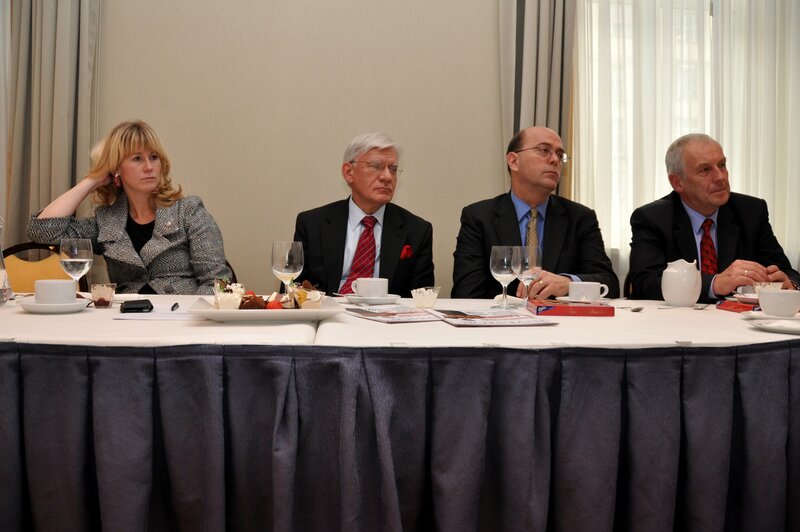 Allen Greenberg, the US Consul General in Kraków, Dorota Dąbrowski, AmCham Executive Director and Roman Rewald, AmCham Chairman met with the presidents and director of AmCham member companies on November 5th, 2009 in Kraków. The goal of the meeting was to update the members on the current and planned activities of AmCham Warsaw office, to listen to members’ problems and concerns as well as to encourage them streamline their problem solving and lobbying efforts through AmCham. Apart from the above, the robust agenda of the event included presentations by: Sławomir Kopeć, the President of the Kraków Technology Park, Prof. Tomasz Szmuc, the Deputy Rector of AGH and Prof. Piotr Tworzewski, the Deputy Rector of the Jagiellonian University who presented prospects for cooperation with universities and invited the participants to get involved in local projects aimed at preparing a unified growth strategy for the years to come. From left to right: Dorota Dąbrowski, AmCham Executive Director, Roman Rewald, AmCham Chairman, Allen S. Greenberg, the US Consul General in Kraków, Prof. Tomasz Szmuc, the Deputy Rector of AGH. The meeting was generously sponsored by Ernst and Young.